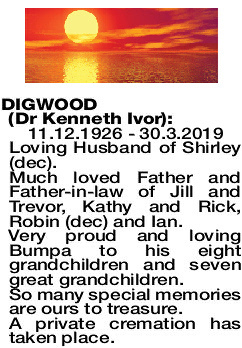 DR KENNETH IVOR 11.12.1926 - 30.3.2019 Loving Husband of Shirley (dec). Much loved Father and Father-in-law of Jill and Trevor, Kathy and Rick, Robin (dec) and Ian. Very proud and loving Bumpa to his eight grandchildren and seven great grandchildren. So many special memories are ours to treasure. 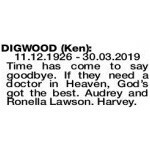 11.12.1926 - 30.03.2019 Time has come to say goodbye. If they need a doctor in Heaven, God's got the best. Audrey and Ronella Lawson. Harvey.